Properties : dye plant, anti-scorbut, used to heal wounds as well as against jaundice. 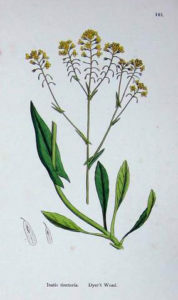 Woad, Isatis tinctoria, was known throughout Europe as far back as theEgyptians, whom used it to dye the cloth wrappings used for the mummies. In the Middle-Age, it was used for its medicinal and healing properties, and according to the archives of the city of Marseille, it was the Moores that introduced Woad to the south of Europe. In the beginning of the 15th century, Woad was found in England as well as in the northern part of Europe, where it was mainly used for dyeing. The leaves were harvested in September and brought to a woad mill where they were crushed under a mill to produce a paste that was left outside and turned over to ferment for several weeks. The moulders would them form “balls (cocagnes)” the size of a grapefruit and leave them to dry in the sunshine for 4 months. They would reduce to the size of a small golf ball, become hard and brown-black. This was the only way to preserve the blue pigment as it would have to travel months and months to dyers throughout Europe. In France, during the Renaissance, the southwest Occitania region, became the very famous “Pays de Cocagne” , a region of “milk and honey”, as all you had to do was lie on your back and watch your wealth dry in the sun. The local woad merchands became extremely rich and built magnificient mansions, castles and churches. But the arrival of foreign Indigos will very quickly bring down the fortunes made upon Woad and entirely replace it until the arrival of Napoleon Bonaparte, which will used Woad to dye the fabric for his uniforms. However, towards the middle of the 19th century , the arrival of synthetic dyes will definitely bury natural dyes such as madder root and woad.